Homes and businesses accelerate their uptake of rooftop solar, with Victoria emerging as the latest hot-spot. 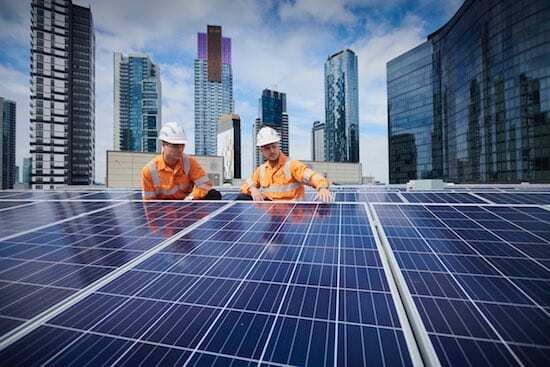 Australian installations of small-scale rooftop soared to yet another record in the month October, with Victoria emerging as the latest hot spot and Western Australia becoming the fourth state to reach the 1GW benchmark. Data compiled by industry statistician Sunwiz reveal 158MW of small scale rooftop solar (sub 100kW) were installed in October, which was 15 per cent above the previous record set in August. “It was a record month, a massive surge across the board,” said Sunwiz director Warwick Johnston. It takes the total for the year to 1.25GW (1,250MW), already well ahead of the 2017 total, and suggests that the 2018 total could meet 1.5GW. This does not include bigger rooftop solar installation (above 100kW) and utility scale installations. The remarkable trend in the latest month is the performance of Victoria, where volumes surged 40 per cent to 37.6MW for the month, just trailing NSW (39MW) as the hottest market in the country, and relegating Queensland to third place. The Victoria market surge could be underpinned in the interest generated by the state-government’s additional rebate announcement, the first stage in a program that will deliver another 2.6GW of rooftop solar in that state over the next 10 years should the Labor government be re-elected in this month’s election. But the increase was widespread, with more than 150,000 homes and businesses adding solar over the month. This is possibly due to some panic buying caused by threats to abolish the small-scale solar scheme, which is being gradually wound down in any case over 12 years but which still offers a rebate equivalent to around 30 per cent of the cost of modules. Despite strong calls by the ACCC and utilities such as Origin Energy and EnergyAustralia, the federal government resisted calls to abolish the rebate scheme and said it had no plans to change it. It may also be due to the ongoing political debate over energy prices, and the realisation that for all its tough talk and sloganeering about “fair dinkum energy”, the federal government can do little to arrest electricity prices without a sensible energy and climate policy. The grand total for the Australian market now stands at 7.74GW, on more than 1.97 million homes and small businesses. Queensland still leads with 2.27GW, followed by NSW (1.75GW), Victoria (1.46GW) and now W.A. with 1.01GW, after adding a record 20MW in the last month. As the Australian PV Institute reported earlier this week, the latest surge in rooftop solar means that the total capacity of solar – rooftop and utility scale – is now more than 10GW. A version of this story was first published in RenewEconomy’s sister site One Step Off The Grid.